Healing, inspiring, and meditative. The ambient sounds of flutes (including alto flute, the unique contra alto flute, double-vessel spirit flutes), piano, and organic percussion. 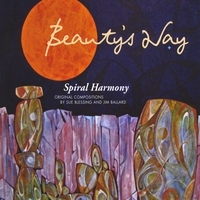 Beauty\'s Way: The universal thread of sound healing is an improvisational journey. With eyes closed, all our instruments became one and took flight; sounding beauty, ever changing, never to be replicated. Sarah Benson understood sound healing as \"only the vibration of love.\" She taught us there are \"no wrong notes\", opened our hearts, and touched our spirits, thus tuning us to find our own unique voices. Her presence was with us throughout our recording, most profoundly during \'Sarah\'s Prayer.\' Sarah died the evening we finished the core flute and piano improvs. The listener may notice, as did we, a signature motif occuring spontaneously throughout Beauty\'s Way, the calling of Sarah\'s name. We invite you to find your own beauty\'s way. Sue Blessing has transitioned from performing only classical music to heart-centered healing sound. She has studied sound healing with Jonathan Goldman and Sarah Saruah Benson, and has performed with the duo “Heaven on Earth” and other world improvisational musicians. Her musical journey, since studying flute at Indiana University, has led her to become a low flute “specialist”, performing on alto flute and one of the only quarter-tone contra-alto flutes in the world. Experimenting with exotic flutes from across the globe, Sue is selectively adding culturally rich instruments to her repertoire. She has performed and recorded locally, nationally, and internationally including live and recorded performances with the International Flute Orchestra. Considering herself a recovering classically trained musician, and since discovering soul improvisation, she has packed her music and joined the ancient chorus of sound. She presently commutes between Massachusetts and her beloved mountain sanctuary in Colorado. When not performing, much of Sue’s time is devoted to the Blessing Foundation, a non-profit organization she created with the intention to preserve, share, and develop all methods of healing and peacemaking through sound and music. The Foundation has been awarding grants annually since 2004. Jim Ballard is an elder, gardener, master musician and intuitive practitioner. Before recognizing his path in sound and healing, he was a practicing architect for twenty years. His past work includes art songs, choral pieces--performed here and in Europe --and a collaborative musical, \"A Rose in the Moon.\" Presently he\'s at work on chamber musicals whose focus is healing, as well as songs and instrumental pieces in a variety of genres. As a performer he appeared with Sarah Benson in the duo \"Heaven on Earth\" from 1999-2006. More recently he has performed and recorded with Sue Blessing as the improv duo \"Spiral Harmony\" and with Charlotte Dewey, Soprano in their duo \"The Pleasure of your Company.\" His CD\'s include \"Beauty\'s Way\" with Sue Blessing and “Mother, Gaia, Maga\" and \"Divine Oneness\" with Sarah Benson. Sarah Saruah Benson, a pioneer in the field of healing sound, was a master musician and poet of the soul. She was co-founder with her husband, Donald Beaman, of Earth Sound Light Center in Charlemont, MA and its director. Sarah traveled the world with her music and sound healing wisdom. From the King\'s Chamber in Egypt to the rain forests of Central America she made music at sacred sites, awakening songs, stories and people. \"Music in the moment\" is what she called it. She gave us permission to sound whatever was in us, saying \"there are no wrong notes,\" and \"there is only the sound of love.\" She taught as much through her presence as by her words, holding space in such a way as to make it totally safe--and sacred--for us to reveal our most intimate, fragile and wondrous selves. Through her many recordings and books of stories and poetry she continues to touch people\'s lives. Hers is a living legacy. A growing pantheon of highly respected individuals carry on the work she inspired. This is a wonderful recording. It has opened my mind to new genres of music I had never considered before. I've had this album for a couple months and ever-time I listen to it moves me in a new way.